Steven (Chicagoland, United States) on 8 June 2010 in People & Portrait and Portfolio. Franklin Delano Roosevelt delivered what came to be known as the "Fireside Chats," a series of thirty evening radio speeches between 1933 and 1944. Roosevelt urged listeners to have faith in the banks and to support his New Deal measures. The fireside chats were considered enormously successful and attracted more listeners than the most popular radio shows during the "Golden Age of Radio." 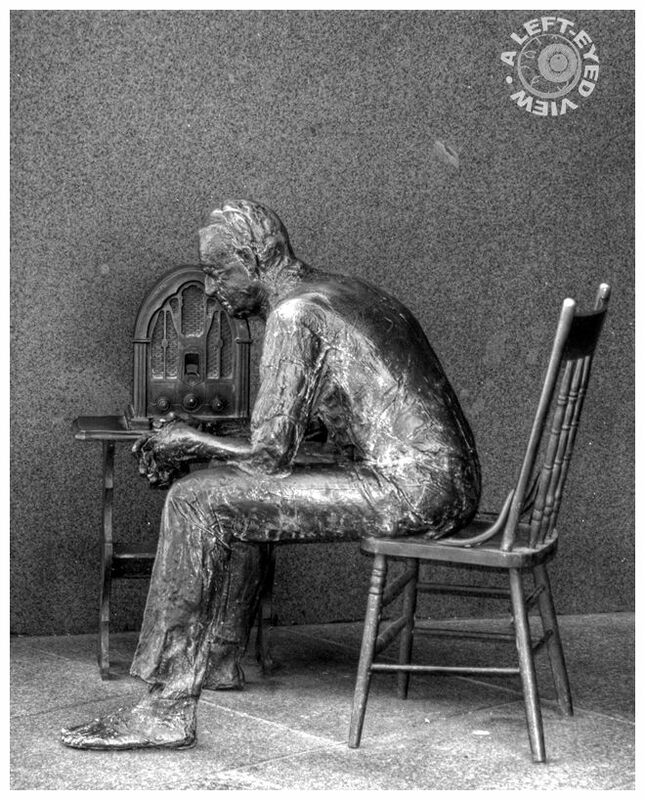 Captured here is a sculpture by George Segal of a man listening to the radio in the second "room" of the FDR memorial. Photo taken May 5, 2010. Very unusual monument, it's using a very different language than traditional ones. Very interesting. what a super looking / super interesting statue ! I was just in a play and we had a radio just like that. I like how you have this one composed. A little more to the left would have wiped out the man's posture - a little more to the right would have detracted from the expression on his face - you really nailed it Thanks for this one, Steven! Superb composition and very good monochrome. Have a lovely afternoon Steven. Again, this really makes a connection. These statues seem so real particularly how you present them in black and white where the metal fades away and you see the people. @Dutch: You were thinking what I was thinking, especially when patina was becoming very much apparent on the statues.